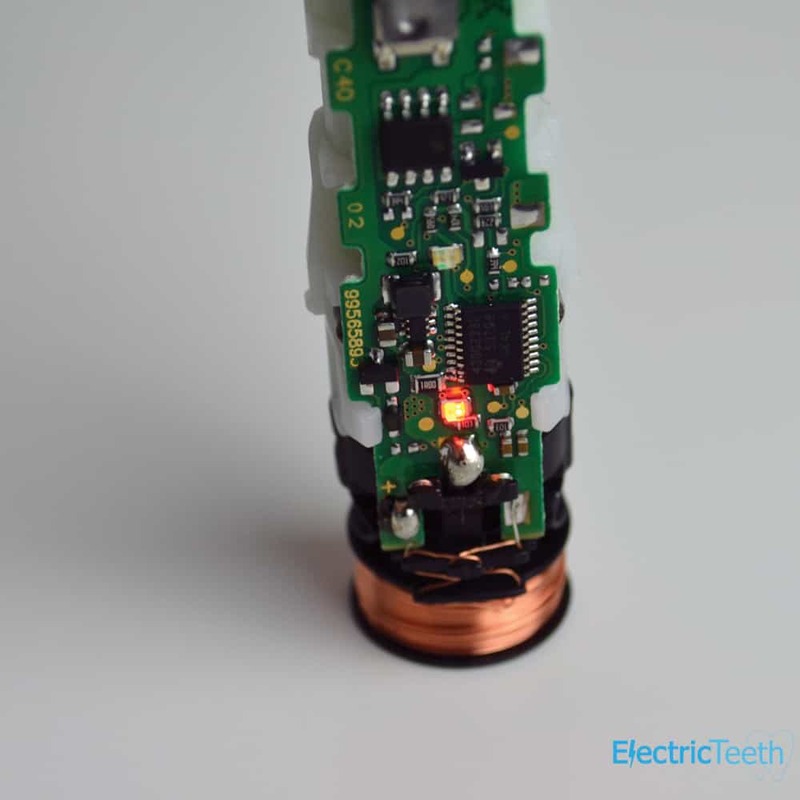 Have you ever wondered: ‘How does an electric toothbrush work?’ – perhaps out of curiosity, perhaps because yours is broken and you need to fix it. Either way, we’ve dismantled one and we’ll be explaining it below with photos an videos. 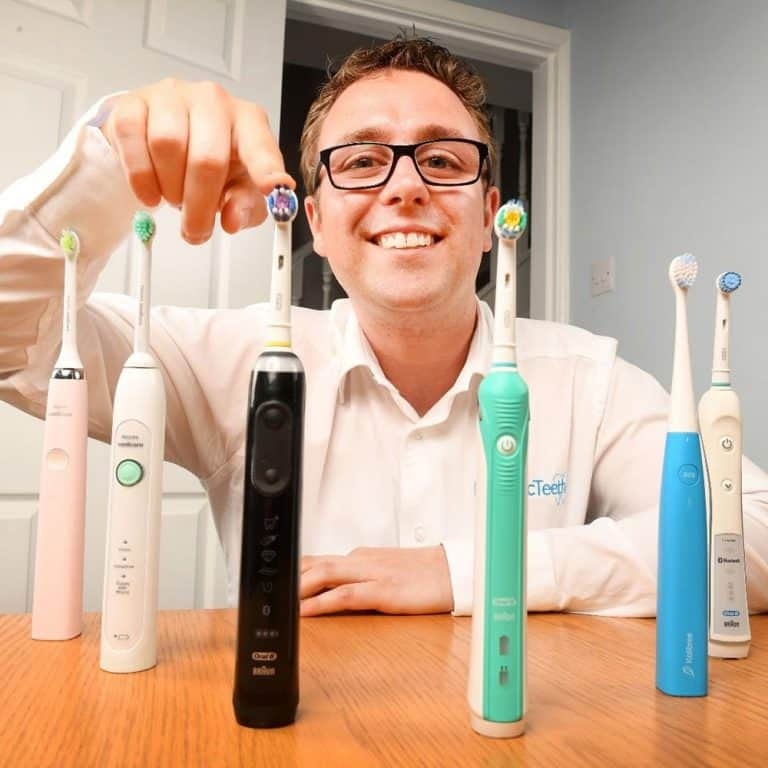 An electric toothbrush is a tool, that uses electricity from a power source (normally a built in battery) to automatically move the bristles on the brush head (so you do not have to) in a way that will maximise how effectively you clean your teeth when the brush is in use. To take the power from the battery to move the brush head requires several components and some electrical circuitry. These key components work together to clean the teeth. 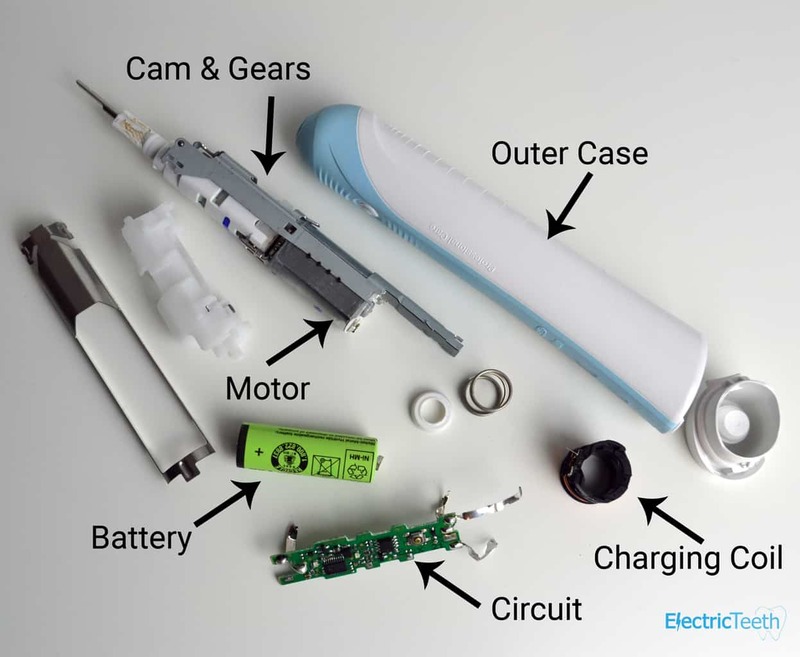 Upon pressing the power/on button found on an electric toothbrush, parts within the brush handle move to activate a switch on a circuit board. 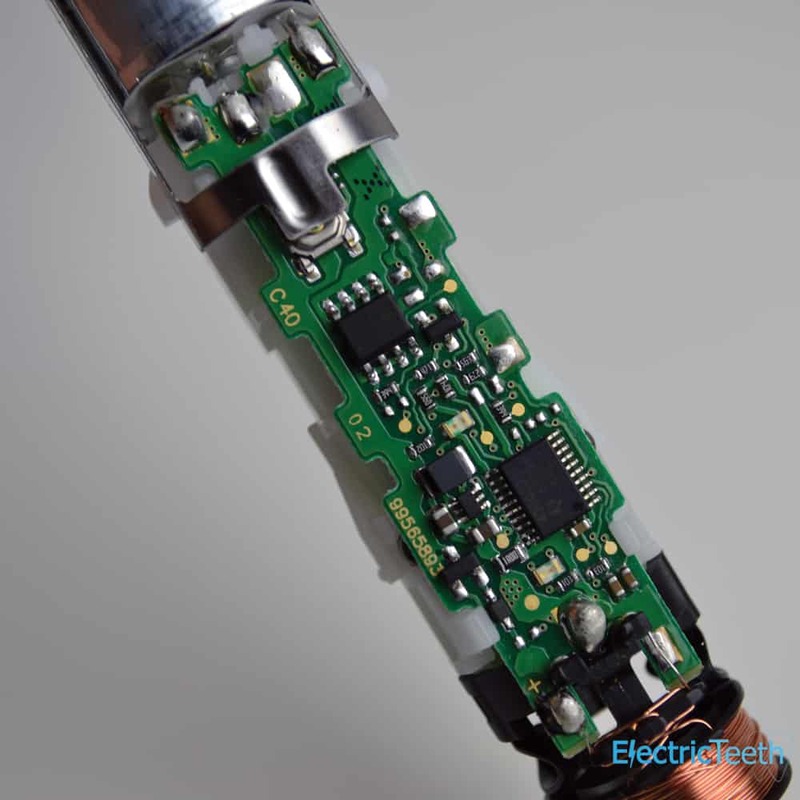 As this switch is activated, power is drawn from the battery and taken through the circuit to the motor which begins to spin. 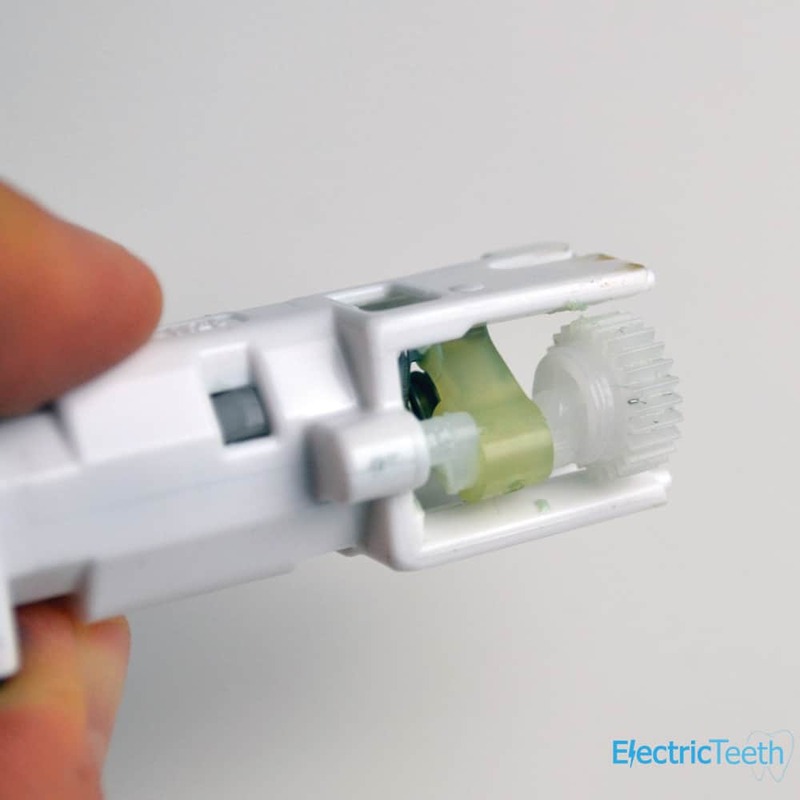 As the motor spins, a cam and gear system converts the high speed spinning motion produced from by the motor and turns it into a back and forth brushing motion that cleans your teeth. This motion is designed to mimic the brushing of teeth, like you would if using a manual toothbrush. As the cam connected to the motor turns, the crank pulls one way, and then the other, reducing the speed and converting it to a side to side motion. 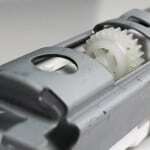 A gearing then passes this motion up through the top of the brush handle and to the connected brush head that ultimately cleans the teeth. 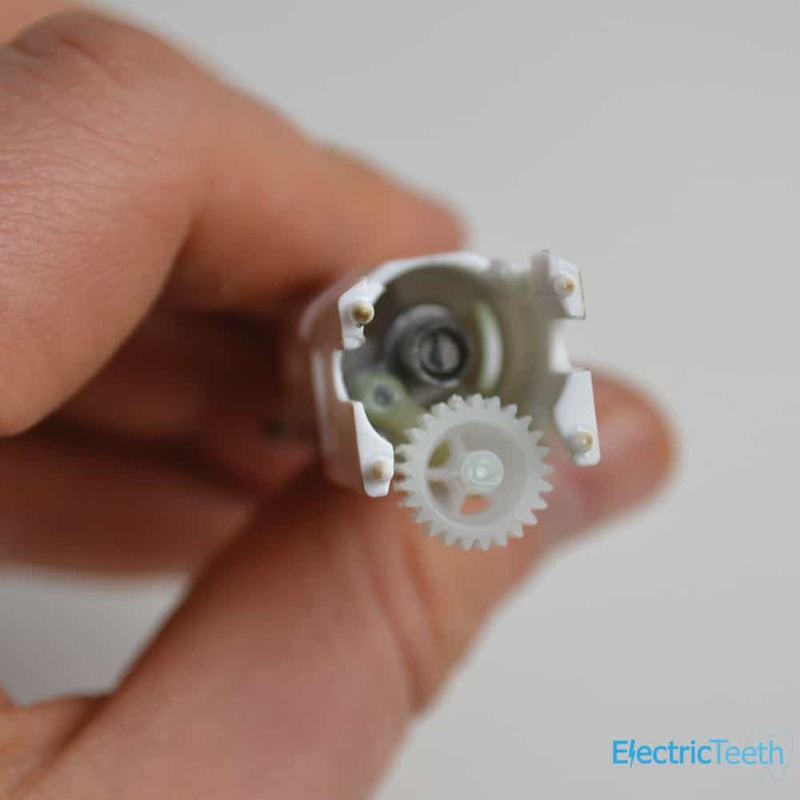 The gear is what makes the brush rotate and is indirectly connecting the brush head to the electric motor inside the brush handle. With Philips and Oral B amongst others that use ‘sonic’ brushing according to manufacturers the whole brush head will vibrate rather than just a simple side to side motion and is in turn suggested to lead to a more effective clean. The internal battery may be depleted at different rates depending on the power required from the battery for the different cleaning modes, but at some point, if the battery is fixed internally within the brush handle will require charging. 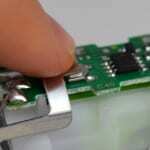 If the battery(s) are replaceable then it is a case of simply taking out the old and replacing with new. 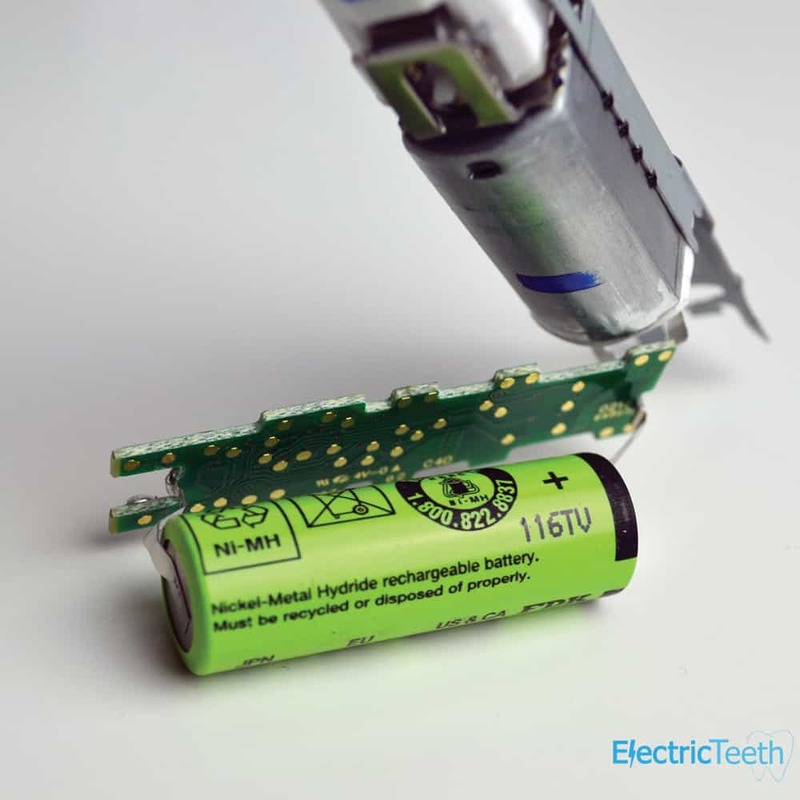 As most modern electric toothbrushes have built in rechargeable batteries, these batteries are recharged via inductive charging. 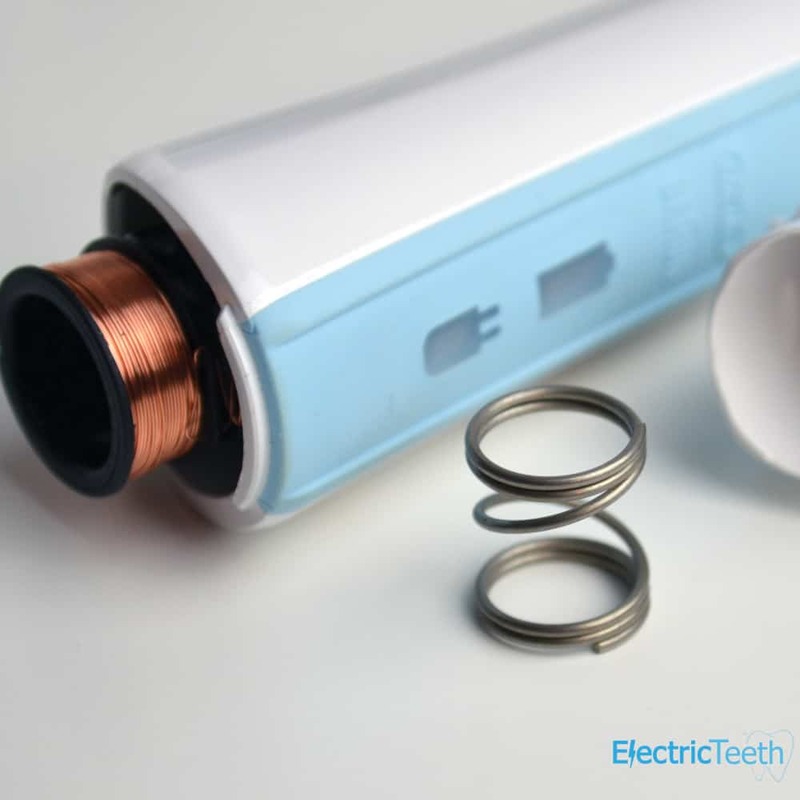 If you look at the bottom of an electric toothbrush or the charging stand for the brush, you will not see any metal contacts or wires for transferring the electrical charge into the battery. It is quite clever and is done in some respects without wires. Have you seen or heard of wireless charging for smartphones? If so, charging an electric toothbrush works in principally the same way. Most electric toothbrushes have a charging stand with a protuberance (that bit of plastic that stands proud that the brush sits on). 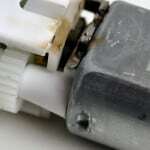 Within the plastic casing is a coil of wire that connects to the mains power. 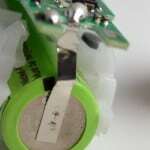 When connected to the mains, a magnetic field is created within the charging stand to make an electromagnet (although a relatively weak one). Usually at the base of the brush where the protuberance connects is another coil (inside the plastic body of the brush) that has a coil around it, connecting to the internal parts of the toothbrush. When the two coils come together it induces a current and transfers the electrical charge from the stand to the battery within the brush. 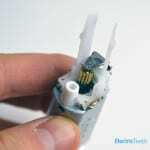 Although the coils never physically touch they are strong enough and close enough together to transfer the charge through the plastic that the coils are protected by. No doubt you learnt from an early age, never to mix water and electrics, and as an electric toothbrush is an electronic item it is necessary to ensure that where possible the battery inside the brush does not come into contact with water. Most brushes are made from a thin, but strong plastic that protects the electrical components inside. 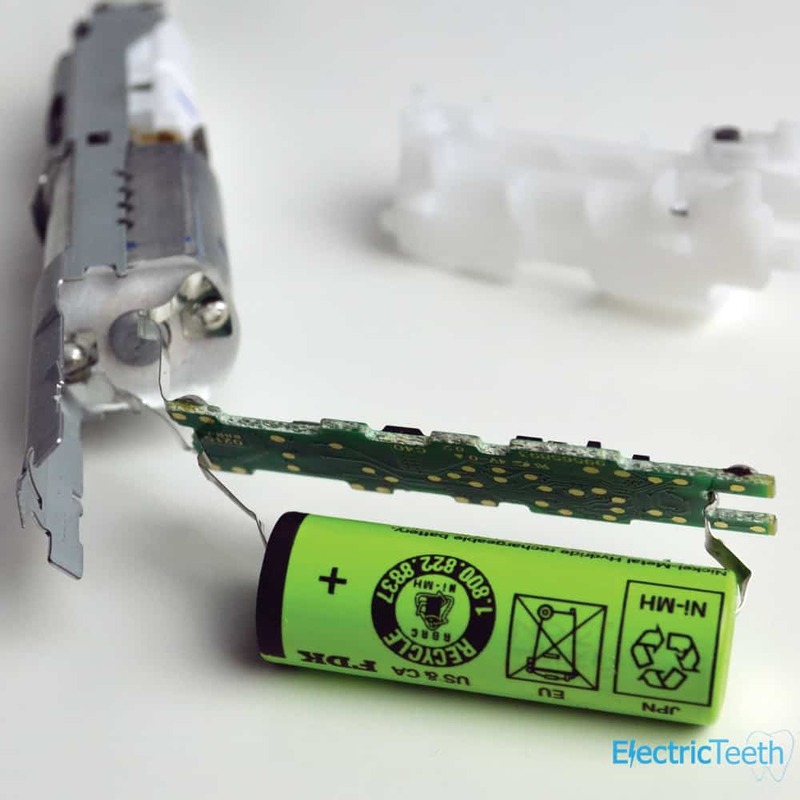 As mentioned earlier, most electric toothbrushes on the market have a built in battery, but there are many that are powered by replaceable and removable batteries. The exact design and build of the brushes vary, but internally the principle by which they work is very similar. 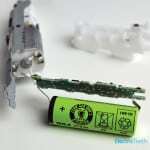 The batteries need to be within a sealed compartment to avoid contact with water and toothpaste that could damage the brush and internal parts. Often large rubber seals are in place to reduce the chances of water seeping into the internal workings of a brush. Different electric toothbrushes will have a slightly different internal layout and construction but the fundamental principles remain the same. 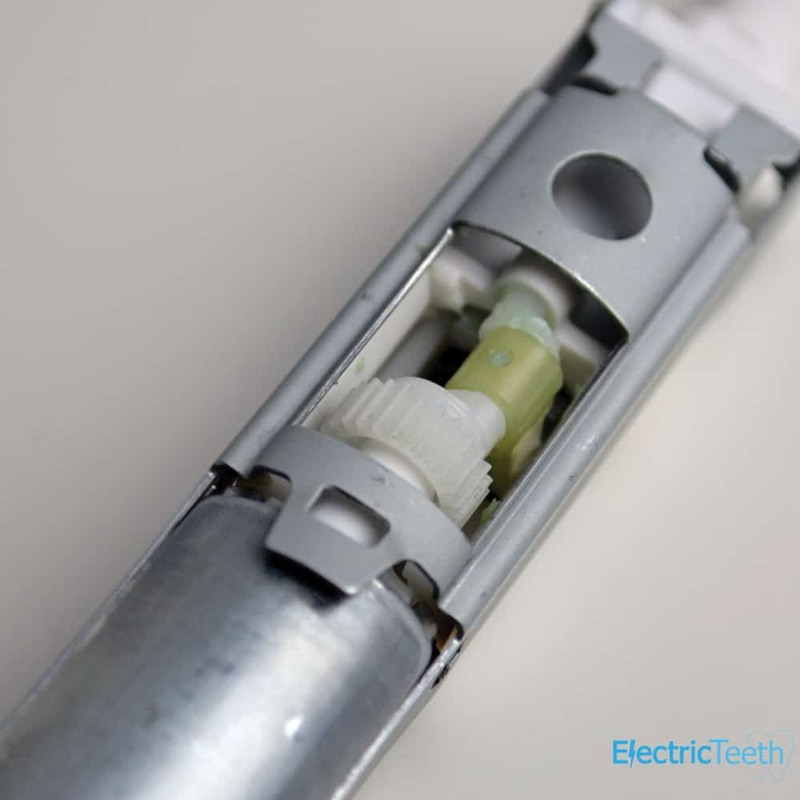 Many premium brushes such as those we review here at Electric Teeth, now offer different cleaning modes, which offer varying speed and motion to you as a user. These different modes are programmed via the internal circuitry to change the speed and in turn the motion of the brush head. A standard clean will often result in more brush head movements per minute than a sensitive clean for example. If the brush allows these different modes, they will be operated by one or more buttons on the housing of the brush handle. As the relevant mode is selected the internal circuit will change the settings for the motor accordingly. These settings and programmes are stored on small memory chips on the circuit inside. More powerful and capable brushes tend to have larger and more complicated circuit boards than the cheaper and less feature rich electric brushes. This circuitry is what also contains the timer and LED notification lights that may apply to your electric toothbrush. Thus, if the brush has a built in 2 minute timer and quadpacer (30 second interval) on board sas the appropriate moment the brush head motion may temporarily change or stop to signify this. 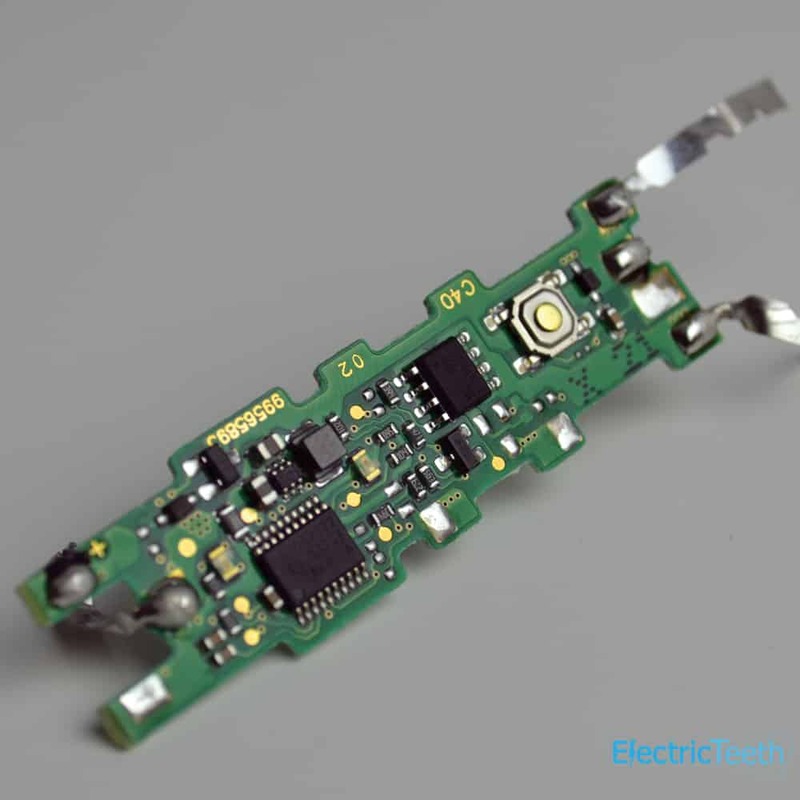 LED’s attached to the circuit board may also illuminate as different times based on the brush and its features. This could be to identify your cleaning mode or battery power level. Many higher end brushes from Oral-B will retain data and even transfer this wirelessly via Bluetooth. All this technology is built into the circuit board. 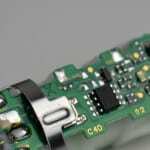 The article Bluetooth connectivity explained, goes into more detail. 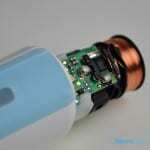 Many brushes have a pressure sensor built in. As the brush is being used, feedback is passed down the gearing within the brush. If too much pressure is being applied, this will be passed through the gearing and at a certain point will activate a switch. 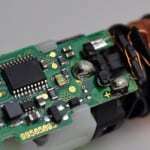 This switch will likely then lead via the circuit board to the illumination of the pressure sensor. As the pressure is reduced, the switch turns off and the light goes out. How can I help Stacy? to start of: Nice article! 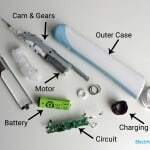 I am a student from germany and (in my free time 😉 ) i am just curious how to built a modern electric toothbrush, including pressure sensors as you mentioned them. Do you actually have access to circuit diagrams of modern toothbrushes? 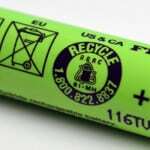 Just couldn’t find those in the internet (just old ones from US patents). Would be a cool challenge to rebuild them manually. Thanks in any case and keep up the good work! Thanks for the comments. I do not have any such diagrams. I obtained all you see from a bit of research and taking a brush apart.